So,.. long time no post. BB on Too busy keeping up with everyone else! 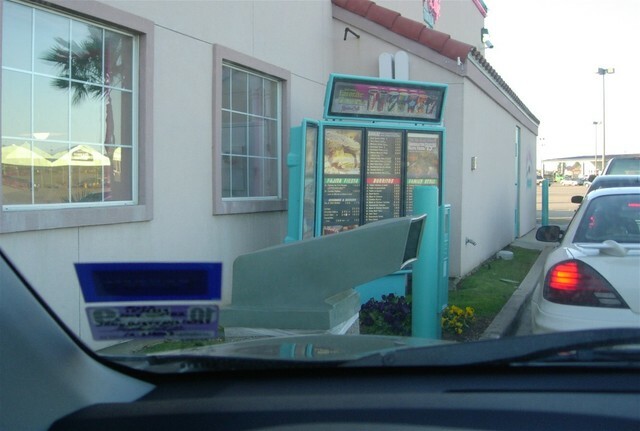 This is what it looks like when I pull up to one of our favorite drive thru taco places. I'm currently hoping that nobody I know noticed me placing my order HERE, when I should have been doing it HERE. So, I am talking to my boss excitedly about a new delivery we received today. Being of significant value, we needed to get a dolly and transport the items to a more secured location. She got up from behind her desk and moaned, stretching and began walking very stiffly. Having been stiff this week myself from working out, I thought maybe this was her problem also. ME: Oh, have you been working out too? Boss: Honey, this is what happens when you get old. Arthur comes to visit. that this is the best stuff ever. Just ran across this interesting blog: True Mom Confessions. These are anonymous confessions from real Moms. Who knows? Maybe it's time I vented too! Yippee! This has been a loooong week. It's Friday and we have NO kids this weekend. What will we ever do? She is the SWEETEST puppy EVAR! 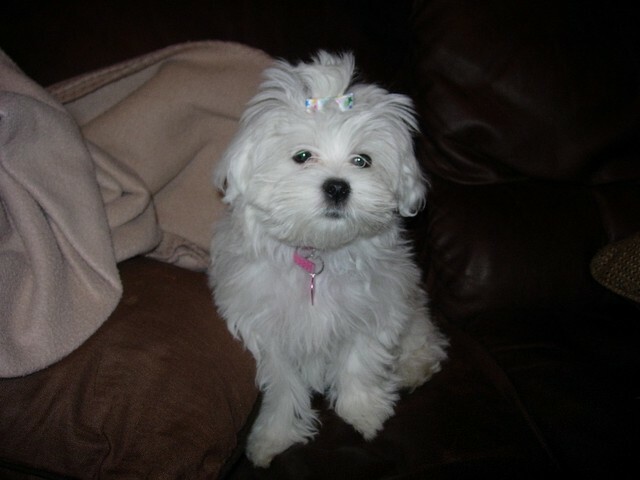 She is a 14 week old Maltese and she is my very own girley-girl. She lets me do her hair and dress her up in her little outfits. My favorite is the white and black leopard print with pink trim and pearls. Real surprise there, huh? She is doing EXTREMELY well, although she is not perfectly and completely house trained as far as the poop goes. I am saying this to prepare you for this next tidbit. "Is this a berry or a dog turd?" "I dunno, check it out and let me know..."
Last night was a night for ME. Yes, you heard that right ladies and gentlemen. Danny took the 2 younger boys out for the evening and since Shane has exams AND had drivers education (don't worry, I will alert the state of Texas when the streets are unsafe) I had a portion of the evening alone. I am a firm believer in the fact that you have to take care of yourself in order to take care of everyone else too. I haven't had any ME time in a while. After picking Shane up from his late drivers education class, I SO wanted to just have a bubble bath with my current book, a sip of wine and then go to bed. Ahhhh!!! Having decided this was my plan, I asked Shane to watch the new puppy (yes, that's a whole different story for later I haven't even delved into here on Bunny Burrow). I got in response, "Huh? The puppy? Tsk... I gueeeeesssss I can watch her, but I'm taking her upstairs with me because I'm tired." I asked him not to let her just snuggle up and go to sleep so she would sleep all night and not wake up at the crack of dawn needing to potty. He said even though he was tired he would try to keep an eye on her. He reluctantly takes the puppy, slowly trudges upstairs and goes to his room. I guess I need to let you know at this point that Shane's room is right above my bathroom. Oh, the peaceful steamy aroma relaxation therapy was calling my name! I stick my big toe in the tub and hear a loud THUD. Hmm.... They were just playing around. Right? That's a good thing! For the next 20 minutes I hear Shane running and jumping and yelling high pitched noises playing with the puppy as well as drumming and patting his hands on the floor to get her to come and her responsive little yippy bark. Let me reiterate, I mean the next 20 minutes in its ENTIRETY right over my head. I dry off and put on my favorite pj's and go upstairs. I hear a scuffle and ALL OF A SUDDEN, you can hear a pin drop. "So, how was she?" I asked. "Oh, her? She was fine I guess.."
"Umm, yeah. I don't think she fell asleep." All this Shane says laying down on the bed with the puppy furiously attacking his socks which still happen to be on his feet. "Okay, then. Thanks for that..."
"MmHmmm," this being said without looking up from his book. Well, I guess I DID ask him to keep her awake -- didn't I? why my lunch appointment stood me up today. Didn't they know how cute I looked? Be glad you married me. Afterall, it very well could save your life some day. 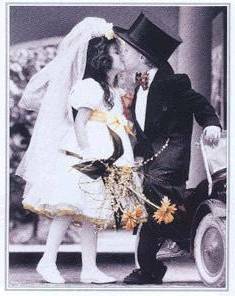 Today marks 6 months of wedded bliss to my one and only! He is truly the best thing that has ever happened to me.